The scroll will be based on the ancient Egyptian “Book of the Dead” (more accurately translated as the “Book of Coming Forth by Day”). For those of you who aren’t familiar with it, the Book of the Dead was a collection of magic spells designed to help ease the passage of one’s soul into the Afterlife; developed from Old Kingdom funerary texts used in the pyramids, in the New Kingdom the Book of the Dead became a somewhat standardized work that anyone could pay to obtain. Since these spells were a virtual necessity for any king’s tomb, I thought it would make perfect sense for me to conclude Pharaoh’s reign with a set of her own! This is a bit of a cheat on my part – the scroll is going to be VERY figure-heavy, so to lighten my work a bit, I’ve made stencils to help me sketch quicker. 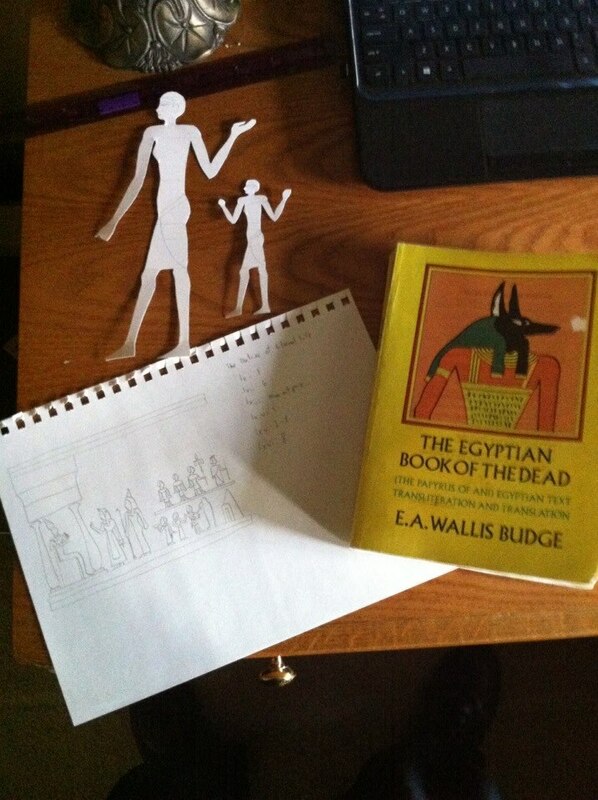 Using measurements based on the ancient Egyptian canon of proportions I created two stencils – one large and one small. The large one will serve for images of the neteru (deities) and the Pharaoh herself; the small one will serve for… everyone else. The ancient Egyptians were avid practitioners of hierarchy of scale, meaning that important people were depicted larger, while less-important people were depicted smaller. With these stencils as a base, I should be able to sketch a large number of figures in various poses and clothing fairly quickly. An important process for any SCA scroll, this step is especially important for one drawing on ancient Egyptian art styles. Because ancient Egyptian scrolls typically consist of painted vignettes interspersed in and among the writing, it becomes critical to layout the entirety of the scroll, not only to ensure that you have enough room for the text but also to ensure that the images have a discernible flow to them; Egyptian art functioned quite literally as picture stories, and were thought to be imbued with magical power all their own… but that is another post… With a rough idea of how the scroll will be laid out, I can move onto the next objective. This wasn’t too difficult since I had a general idea of the sort of verses I wanted: nothing overly esoteric or complicated (which Egyptian magic frequently was), nothing too depressing, and something that sounded cool in English but that I could also pronounce in the actual ancient Egyptian language. As such it was a matter of flipping through my copy of E. A. Wallis Budge’s translation of the Book of the Dead and finding verses that I thought would work. This step I haven’t actually done yet. The scroll will be papyrus of course, so I’ll have to get that from the local specialty artist shop. I already have plenty of scribal supplies, though for this work I may have to upgrade my paints to a higher quality. Once I have the materials I need, I can actually start preliminary work on the scroll.